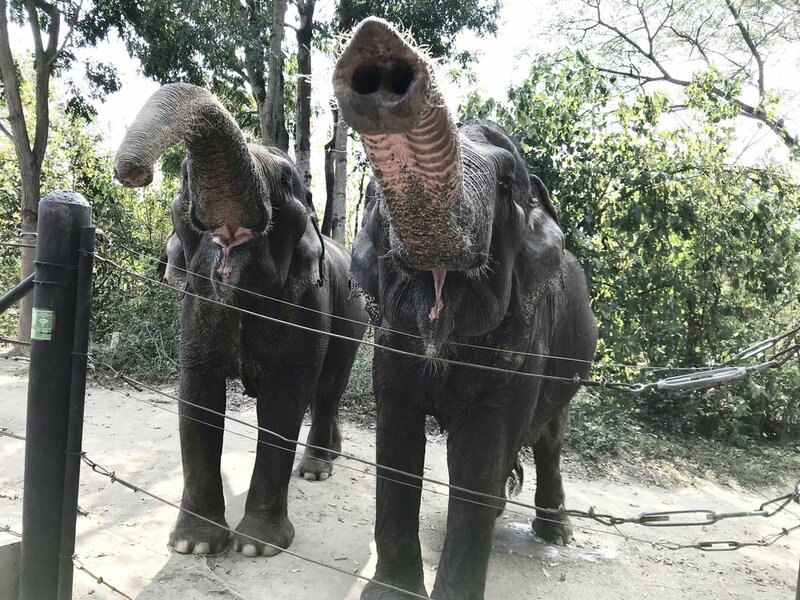 Majority of the elephants at the sanctuary were rescued from elephant riding—or “trekking”—camps in the tourism industry (yet many were also previously exploited for years in the logging industry before Thailand banned logging in 1989). The only elephant at the sanctuary who did not have a history of giving rides to tourists was a baby named Pin, who was lucky enough to be rescued along with her mother, Pun. If she hadn’t been rescued, she would’ve undergone the heartbreaking process of breaking an elephant’s spirit. It’s how those who exploit elephants tame them—ripping the elephant away from its mother and herd, giving it just enough food and water to survive, beating it until it lets out a heart-wrenching cry that signals its spirit has broken and it has lost all hope for its mother coming back—at which point a mahout (elephant handler) steps in with food and water, thereby gaining the elephant’s trust. 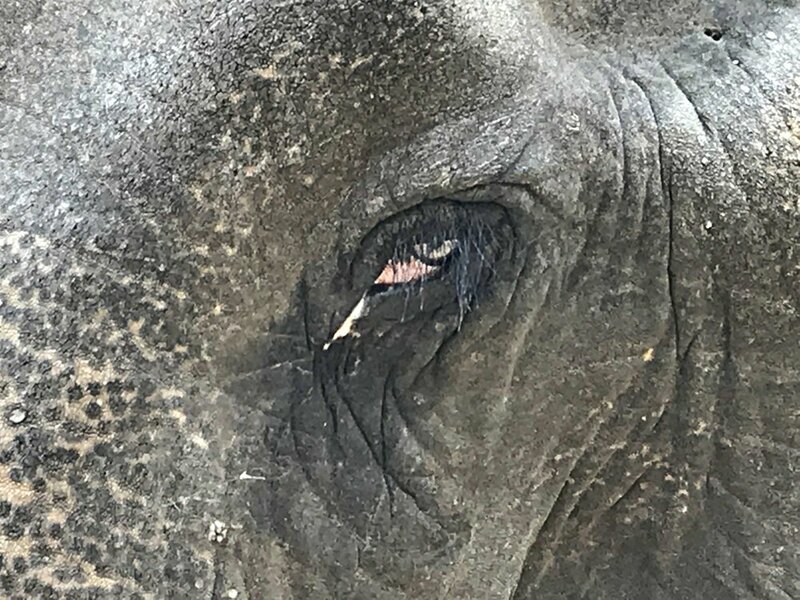 Having been spared from elephant trekking abuse, Pin had a healthy round back with no indentation or spinal deformity that the other elephants had from years of carrying tourists and heavy logs. About 40% of the animals that WFFT rehabilitate are released back into the wild—an impressive rate of release. The reason for this is WFFT's strict hands-off policy when it comes to wildlife, with the exception of the elephants. And the only times volunteers are allowed to actually touch the elephants (i.e., feed, walk and bathe them), is when the mahouts are around to supervise and give the green light. The less human interaction there is, the better the chances of wild animals staying wild and eventually being released back into their rightful home. Unfortunately, the elephants can never be released because they spent too many years around humans and learned to rely on them too much. Sundays were transition days when many volunteers left and new ones arrived—weary from their long journey to the sanctuary but equally brimming with excitement. There was a brief orientation at the volunteer house followed by a 2-3 hour informative tour (by foot and bus) of the entire WFFT grounds, from the wildlife rescue center to the elephant refuge. Throughout the tour, volunteers learned the heartbreaking histories of the animal residents. They were tough to listen to but absolutely necessary so that we could share them with others, spread awareness and discourage people from participating in any attraction or trade that exploits and mistreats wild animals. We learned about the cruel practice of taming elephants by breaking their spirits ("crushing"), why some of the rescued elephants are missing eyelashes and hair on their tails because they were plucked for keychains, why there’s only one bull elephant at the sanctuary (males are super aggressive and thus harder to train for elephant riding), and how many of the animals were kept as pets by people who had no idea how to properly care for and feed them. There was the story of the sun bears, Pepsi and Cola, who were rescued from a temple and wouldn’t drink anything but Pepsi and Cola when they first arrived at the sanctuary because that’s what they were given. Then there was Bernie the cassowary who is now brain damaged because these wild birds are extremely aggressive by nature. Those who captured Bernie didn’t know what to do with him when he ran amok that they repeatedly beat him on the head to get him to calm down. We also learned that majority of the bears at the sanctuary were rescued from bear bile farms, the barbaric and invasive practice of repeatedly extracting bile from bears by inserting catheters into their gallbladder. Bile is widely used in traditional Asian medicine and even common household products, and the bile business is leading to the bears’ dwindling population in the wild (it’s believed that wild bears have more potent bile). Aside from that, bears in bile farms are kept in cramped cages and filthy conditions, with many bears dying from infection, cancer and self-inflicted wounds. My husband and I split our time between the two projects (wildlife rescue center and elephant refuge) because we wanted to work with a variety of animals. Each project had a different rhythm and dynamic, both presenting different challenges and rewards. Every day was structured except for our days off (elephant refuge volunteers got two days off per week and wildlife rescue center volunteers got one day). We gathered at the volunteer house groggy and sleepy-eyed every morning around 6:20 (no later than 6:30). The walls were lined with whiteboards divided into the two different projects—elephant and wildlife—and the teams assigned to various groups of animals (Primates 1, Primates 2, Bears 1, Bears 2, Other Wildlife, etc. ; if you were on the elephant project, it listed a set of elephants your team was assigned to). Unless you were assigned as a team leader or team leader in training (those volunteering for more than one week at a project), then you were placed on different teams each day, giving you the opportunity to work with different volunteers. No one was harmed, just amazed at how firm and humanlike the grip was! Once we found our teams, we gathered at the designated food houses to prepare breakfast for the animals (Rule #1: animals always eat before volunteers do). Majority of the animals’ diets consisted of chopped fruits and vegetables, but there were uncomfortable situations where I had to place cooked chicken in dishes for the nocturnals like slow lorises and civets—even as chickens roamed all around me at the food prep tables and throughout the sanctuary. After we fed our assigned animals, refilled their water containers, and cleaned the food prep space, we made our way to the Elephant Kitchen at 8 AM for breakfast. One thing you quickly learn as a volunteer is that you better get there on time or you’ll be at the back of a long line only to find that the food you wanted is all gone. Two lines formed at breakfast every day—one for bread and the toaster, and another for the rest of the food like baby bananas, watermelon or pineapple, oatmeal, cereal, instant coffee, as well as fried eggs and milk for the non-vegans. It was pretty much the same routine for lunch at noon and dinner at 6 PM. Lunch and dinner featured heartier meals (usually Thai cuisine), almost always with rice. I did find it ironic that despite some of the rescued animals being cows and pigs—and with all the chickens roaming around—WFFT always served meat, eggs and dairy. Somehow there was a huge disconnect there. I did appreciate that they accommodated vegans though, and the food was delicious! The dining area overlooked an enclosure for the sanctuary’s oldest elephant: Pai Lin. I always preferred to eat at the corner table next to her enclosure because she usually dined along with us, chomping on her fresh grass for breakfast. My first morning there was when the reality of the experience hit me: I was eating just feet away from an elephant. How cool is that?! I always made it a point to savor the experience because I knew I would miss it once I returned home. After breakfast, we met up with our teams for the next few tasks that we had to complete before lunch at noon. These tasks often included “special projects” (usually one in the morning and one in the afternoon), which almost always meant sweeping enclosures, picking up poo, cleaning pig troughs and drinking pans, and scrubbing animal pools—basically all the dirty work that made you glad (or wish) you packed heavy-duty gloves. On our second morning there, all the teams came together for the biggest, smelliest, dirtiest task of all: cleaning the otter pool. This was no ordinary pool—it was like a mini waterpark for the otters. It was basically two large pools (one of which was about 5 feet deep) joined by a water slide with twists and turns. And since otters eat fish, we found scales, bones and pungent seafood smells while we were scrubbing away at the thick layers of algae. Otters are "otterly" adorable though (just had to throw that in), so they were worth the work. Plus, that was one of the first times I really felt a sense of camaraderie and had fun toiling under the sun; people were joking and laughing, others were dancing and singing along to songs blasting from someone's portable speaker, simply having a good time. I just wish we had the chance to see the otters enjoy their newly cleaned pool. We were given several breaks throughout the workdays, and if our teams finished a task early, then we got another mini break. Primates 1 team often fell behind schedule (and often arrived late to breakfast) because the early morning tasks required a lot of chopping, counting and proportioning fruits and vegetables as well as distributing them to over 100 animals (the different species of gibbons and macaques). This didn't include the different primates in quarantine (langurs and the two orangutans) as other teams were assigned to take care of their food. After lunch, the tasks typically involved more food prep, feeding animals and refilling their drinking water, washing dishes, a special project or two, and preparing enrichments. Creating enrichments were a common daily task for all the teams on the wildlife and elephant projects. Even though the animals are in a much better place at the sanctuary than they were in their previous lives, they are sadly still in captivity. So every day, we created enrichments to give them some kind of activity that would hopefully stimulate their minds and make it a little more challenging for them to get their food. For example, we hid the fruits from the bears as best we could, and placed them in hanging tires, up on a branch, or on the grass somewhere deep within their outside enclosures. For the gibbons, we stuck twigs into sliced bananas so that the gibbons would have to pluck them out in order to eat. They were always too smart for such a basic enrichment, but unfortunately, teams assigned to Primates 1 didn't really have much time to create enrichments that were challenging enough. Since elephants are on their feet for approximately 18-20 hours a day, they try to take the weight off one of their legs every now and then. "I'm just going to rest my trunk here for now." We started working on the elephant project on our second Sunday at WFFT, which also happened to be harvest day. Volunteers tended to dread those words more than "special project" because harvest day took place every other day and was the most physically challenging of all the tasks. Although there were also volunteers who loved harvest day and even requested to be chosen. Volunteers were randomly selected for the harvest team, which typically consisted of 12 people—except on Sundays when many volunteers left. Since harvest day happened to land on a Sunday, we only had a team of about 8 or 9 people that day. Harvest started at 8:30 AM, which meant that volunteers only got 30 minutes to eat breakfast. At 8:30 AM, we jumped onto a truck while another truck led the way to a banana tree plantation about five miles from WFFT. Once we got there, the mahouts who accompanied us started hacking away at the banana trees with machetes. The thought of what a machete could accidentally do to someone's limb made me shudder, but by the way those mahouts were handling the machetes, you would've thought they were holding butter knives. After the mahouts spent about 5-10 minutes chopping down banana trees, we picked up the first set of tree trunks and loaded them onto the truck. (Side note: I just learned that banana "trees" are actually the largest herbaceous plants—not trees.) The heaviest tree trunk weighed between 150-200 lbs. while the lightest weighed around 30-40 lbs. The heaviest one took about three men to carry, although there was one guy who had been volunteering there for months who was able to carry two medium-large tree trunks on each shoulder. There were a handful of girls who carried impressive loads all on their own as well. The challenge wasn't just the weight of the tree trunks; it was the slickness of the trunks since they contained so much water, and the uneven ground scattered with fallen banana tree leaves, vines, and of course the possibility of stepping on a snake or scorpion. Snakes and scorpions love to hide under mounds of leaves, twigs and branches, which is why we had to constantly sweep animal enclosures. This arduous and tedious process took about 2 to 2.5 hours, especially since we were a few people short. Once we finished filling the truck, we were taken to a nearby river as a reward for our hard work. Everyone jumped in except for three people, myself included. Aside from having super sensitive skin, I didn't want to risk getting an eye infection since I was wearing contact lenses. Those who swam came out just fine though. One of the uses for banana trees was to make elephant enrichments. These were anything from banana tree logs stuffed with fruits and hay, to fruits wrapped in banana tree bark, to tires stuffed with fruit wraps all held together by nets, ropes and bark. My husband and I also volunteered for one day to join six others who were working on a more permanent enrichment: a huge double-layered tire wall for two elephants, Jele and Wassana, in Project 4 (the newest enclosure in the sanctuary that offers elephants and other animals the closest thing to being out in the wild). We made cement (no machinery, just muscle power), poured it into thick poles that would prop the tire wall, and the guys drilled holes into tires so that we could attach them with nuts and bolts. It was a cool way to create something lasting, although elephant enrichments tend to wear out fast due to the elephants' monumental strength. The first wall they built didn't even last a day. As you can imagine, when it comes to elephants everything is super-sized, including their poo. Even though we were accustomed to picking up animal poo at that point, elephant dung is a whole new experience. There's nothing quite like it. Apparently elephants only digest a little more than 40% of the food they eat, so what goes in comes out pretty intact, all in the form of hefty, dense logs that are sometimes strung together. More importantly, they're not as smelly as you would expect. Thankfully so because we had to pick up elephant dung with our hands—gloved hands. It took a few times to finally get over the fact that I was literally handpicking elephant poo, but after seeing others be so blasé about it, I soon took on the same attitude. However, you'd still want to exercise caution: don't talk while you're picking up poo, lest one of the gnats swarm out of it and into your mouth (I heard this happened to a volunteer); wear sunglasses or eyeglasses to protect your eyes; and of course, wear heavy-duty waterproof gloves. There are times when it feels like all you’re doing is picking up elephant poo—for us that happened to be Valentine’s Day. We spent the morning picking up poo, loading it onto trucks, unloading it, and fertilizing the soil with it; not exactly romantic but it was a Valentine's Day I will never forget! Since elephants don't digest much of their food, their dung is rich in nutrients, which is why we used it to fertilize the soil, laying 2-inch thick elephant poo “carpet” where no grass had grown. Why let a good thing go to waste, right? "I have an itch to scratch before heading back." "I go this way, you go that way." Although we spent the first half of Valentine’s Day working on the not-so-fun stuff, the second half of the day more than made up for it because we were lucky enough to walk with elephants, Boon Chuey and Dao Rueng, to the nearby forest and back. (Not all elephants like to walk or have the temperament for volunteers to walk with them.) To keep the elephants walking in the right direction, we each held a bucket of bananas, watermelons and pineapples and fed them a piece every 15 steps or so. Rule #2: Don’t get in an elephant’s blind spot (anywhere behind them or directly in front of them). Walking close to an animal of that size and strength evokes awe, fear and an overwhelming sense of respect all at once. You can’t help but feel pure reverence towards an animal that has the power to crush you in a second, and yet has the same sensitivity and capacity to love and nurture as humans do—arguably even more. One of the highlights was walking a couple elephants who had spent the day exploring Project 4 back into their enclosures for the evening. My husband and I accompanied two of the mahouts to the open fields in search of the two elephants. After the mahouts called out to them, we spotted movement behind the brush; one elephant responded faster than the other. It was almost as though the other elephant was saying, “I hear you, but I’m having too much fun out here. I’m not ready to go to in yet.” After a few more calls, the other elephant finally walked towards us. It's pretty surreal to see an elephant come out of the forest and walk towards you, as though you were just calling your dog or cat in for the night. Once the elephants reached us, we assumed the position—bucket in one hand and a fruit in the other—and walked with them for a good 15-20 minutes. Breakfast for most of the elephants were banana balls: hand-mashed bananas, wheat (?) germ and pellets that we mixed into a dough-like consistency. The elephants eagerly awaited these sweet treats, standing by the fence as we walked up, some with their mouths already wide open. Sometimes we had to outsmart the elephants who ate too fast, otherwise they’d steal the other elephants’ food. So instead of the standard eight, we divided the mixture into 16 smaller balls for the speed-eaters. In the mornings, we chopped up fruits and corn to be used for special enrichments, as well as fruits for the elephant showers and walks. Whenever there were tour groups, the visitors were given a chance to walk and hose off the elephants. This was all part of the tour experience in which visitors learned about WFFT and its rescues while getting up close and personal with the elephants in a way that did not harm or exploit them. These tours focused on education, a vital way to foster appreciation for wildlife, share their beauty and importance, and spread awareness about the issues they face. If a tour group walked an elephant, the shower came after. A big plastic tub filled with water and freshly cut fruit kept the elephant busy while visitors took turns spraying her with a hose and brushing off dirt, avoiding the belly—an elephant’s most vulnerable side. I had a couple opportunities to give an elephant a shower, which was a lot like washing a big truck, especially if you’re short like me. It’s an enjoyable experience for all—the elephant probably appreciates the relief from the heat, and the ones showering her get to enjoy a rare and memorable moment. In the late afternoon, the elephants are fed more banana balls, banana trees, grass as well as their enrichments. The final feed outs are done differently depending on where the elephants are located. For the ones in Project 4, we got to ride in a truck and throw banana tree logs over the fence every few feet throughout the perimeter of their enclosure so that they'd have to 'forage' for food. WFFT does a great job balancing work and fun so that volunteers are given the opportunity to experience the richness of Thai culture and the country's jaw-dropping landscapes. They offer evening excursions to various nearby attractions such as the bat caves at sunset plus Cha-Am night market, Hua Hin night market, and Robinson shopping center so that those who worked all day can still participate. They also arrange transportation to a water park and the local spa. The only excursion that isn't near WFFT is Kui Buri National Park where you can see wild elephants roam. This one is a little more challenging to get to because it's a 2-hour drive (one way) without traffic and transportation costs more unless you can get at least 4 people to go with you. My husband and I were able to cram so much into our three days off. We visited a total of five temples, one of which was the famed yet hard-to-reach temple inside Phraya Nakhon Cave (a photographer's dream) located in Khao Sam Roi National Park in Prachuap Khiri Khan province. If you go there, be prepared to hike a lot but it's well worth it. You feel like you're in an Indiana Jones movie. You'll also be rewarded with a pretty isolated beach with fewer tourists, complete with clear blue waters, white sand and a restaurant overlooking it all so you can enjoy a meal after all that hiking. We enjoyed a delicious vegan feast at Royal Diamond Hotel thanks to our awesome driver, Dae, who is one of WFFT's go-to cab drivers; got most of our souvenir shopping done at Hua Hin Market Village and other nearby shops; had the best Thai massage ever at Suvaree Thai Massage (they cracked me in all the right places and seriously fixed my long-standing neck and back issues); and ate at Hua Hin Vegan Cafe & Wine twice in one day because it was that good (do yourself a favor and eat there regardless of whether or not you're vegan). If you’re interested in volunteering, you can sign up directly with Wildlife Friends Foundation Thailand, or through travel volunteer agencies like Volunteer Travels, which is what I did. Either way, the costs cover your lodging, food and drinks throughout your entire stay, with a portion going directly to the care of the animals.